Is it possible to move bookmarks from the bookmarks toolbar to the main bookmarks area? I have tried that and they simply will not move out of the toolbar area. Is there some special technique required other than drag and drop? Maybe the only way to do it is to edit the HTML file directly? I tried using the bookmarks page from the menu. It would not do it. The bookmarks folder kept jumping back to the bookmarks menu. I also tried doing that with V7 Bookmarks. There seems to be no way to do that from there. 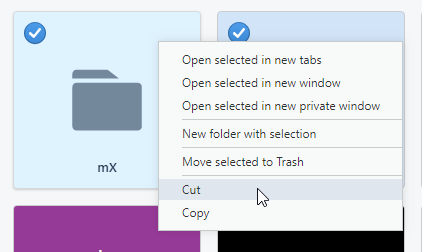 All I wanted to do was see if all the folders in the bookmarks would now be displayed from the main menu. A few versions ago, the list was cut off a little past halfway down. Put it under the second Bookmarks. I know, looks silly to have a folder named Bookmarks inside Bookmarks, but there it is. The bookmarks are already in there. That Bookmarks folder is the one on the bookmarks toolbar. There is no access to the parent directory of the bookmarks toolbar any more. That is the problem. The Bookmarks on the left at the top of the list is just a line of text, not the parent directory. The parent directory is simply not available to add things. Once you take everything out of there except the hard-wired directories, there is no way to get back. I was wondering if putting most of the bookmarks back into the parent directory would make it possible to use the "Add to Bookmarks" menu item again. It does not work with Opera 56 or subsequent versions. The doorhanger that drops down from the heart symbol is totally blank.